Longtime Treadle customer Mary Anderson stopped by the other day wearing such a cute outfit and kindly agreed to be photographed! Take a look! Mary loves making pretty skirts and has a few favorite patterns she uses over and over again. Then it's just a matter of "adding all the fiddle faddle," she says. Details like ribbon, rickrack, bias tape, and contrast fabrics really make her projects unique! Lace isn't just for bridal gowns! We have an abundance of gorgeous lace fabric in an array of colors and styles for spring and summer. From delicate beaded laces to rich embroidered net, you'll find something to coordinate with any look. So why not add a little lace? Or a lot? Spring is here and that means lighter fabrics. 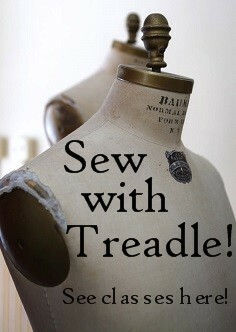 If you love sewing with wool (and who doesn't? It's so soft and forgiving!) don't despair! 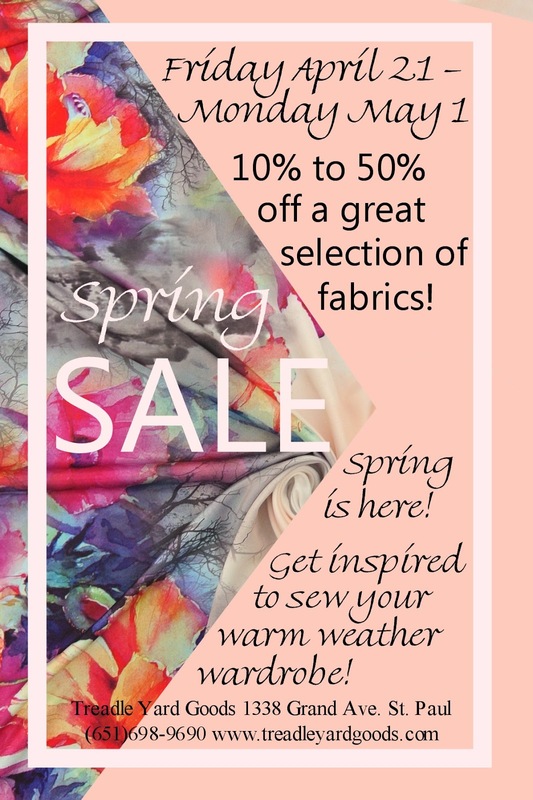 Take a look at these springy wools and wool/silk blends! We have more new changeable sequin fabric! Run your hand across and the sequins flip, revealing the contrasting color on the other side! These fabrics make drop-dead gorgeous evening wear, but we are also seeing a lot of demand for small throw pillows. They're a small pop of glam for your decor and also make the world's most elegant etch-a-sketch! So fun, so satisfying! This embroidered jacket by Jennifer is still a work in progress, but I loved it so much I wanted to share it right now! Jennifer started with a plain, readymade denim jacket and then let loose with embellishments. Surface decoration is really one of Jennifer's wonderful talents, and she brought embroidery, trims, and beadwork into play here. She intentionally left the area between the gold braids blank for a visual white space. It's easy to overdo embroidery so you have to know when to stop! The digital prints we've been seeing lately have been just breathtaking, and these are no exception. Wonderfully large-scale prints, packed with detail, are printed on fine, drapey, poly satin or crepe. Our Spring Sale starts tomorrow! Friday, April 21! We have loads of gorgeous new bolts of Cotton and Steel fabrics! First up, these linen blend and canvas prints. A heavier weight is great for skirts, jackets, and bags! Lots of the cotton prints feature wacky animals, like these cute raccoons! And a few, like these birds, have metallic print! So in right now! These dotted prints have an unbleached muslin base. The tiny flecks and imperfections add a lovely character! There's always more in the store. Come take a look! Today's Treadlette Pick comes to you from both Michele and Roberta! They both chose this beautiful new printed silk noil as one of their current favorites. It's very unique - "You never see silk noil in a print!" Michele says. "It's easy to sew on and really washable." Silk noil's soft, nubbly texture and lovely drape make it perfect for a variety of garments. Roberta says"You can dress it up or down!" Skirts, dresses, blouses, and scarves would all be gorgeous. The print is both geometric and organic, with large blocks of delicate floral patterns overlapping. Roberta notes, "It has a bohemian charm." "And that's very on trend right now!" added Michele. This laminated fabric takes a cotton prints and coats it with supple, waterproof vinyl. Make your own great aprons, raincoats, baby bibs, lunch bags, and more! We have some gorgeous new knit prints from Art Gallery. Take a look! We have a lot more new fabric from Art Gallery - cottons, lawns, and rayons! - coming up soon! Today we have another Treadlette notion pick, one of Melissa's favorites: EZ-Steam II, a double-sided fusible tape, used for adhering fabrics together. "You can use it to put in a zipper instead of basting; you can fix ribbons to things; you can put up a hem, and it'll be permanent, once it's ironed on." There are a lot of fusible products similar to this one, so I asked Melissa why she likes EZ-Steam best. "It's permanent! Plus you can sew through it, if you use it for basting, and it won't gum up the needle." These brushed cottons are lighter and more delicate than ordinary flannel, but have all the same fluffy softness. You could use these for sewing up lightweight pajamas, but they'd be especially lovely as shirts or dresses. With a variety of prints, some whimsical, some more abstract, you'll find one for kids or adults! Tula Pink's new collection, Tabby Road, is simply meow-velous! We love the super bright neon palette and the cute (but slightly weird!) kitties. Love sewing with knits? Take a look at these gorgeous new tissue-weight knits! Made of soft, sheer, 100% viscose rayon, they have an airy drape and very fine texture. Tissue weight knits like these are so light, they're perfect for creating lots of details like gathers and draped effects. No need to worry about adding bulk to your garment with ruching and ruffles! They'll be as light as a spring breeze.